Summer is over and it’s back to school for the kids. But what about us? Going back to school to learn a new skill could actually be fun. Luckily, continuing education and leisure classes abound in our town. Do you want to hone your cake decorating skills? Or finally learn to fly? If you are interested in something creative, look no further than our abundant arts groups and organizations for creative classes ranging from pottery, dancing, singing, improv, and flower arranging. The Tulsa County Parks department (Parks.TulsaCounty.org) offers a plethora of adult classes from clog dancing to beginners golf. So dig in, do an online search, and sign up for a class—just for the heck of it. We have picked a few of the more unusual classes for you to consider. Wouldn’t it be great to Scuba Dive on your next trip to Cozumel? It’s simple to get the training right here in Tulsa at Poseidon Adventures. Owned by Randy and Sara Piper since 1982, Poseidon has a full time professional training staff offering PADI Scuba diving certification training any day of the week in a private, heated, on-site, indoor pool. The beginner’s diving class is $250 with the purchase of mask, fins, snorkel, and boots. The enjoyable, non-strenuous 2-week or weekend class can easily fit in your schedule. Visit ScubaTulsa.com to view all available classes. Skydiving is on many bucket lists. Check it off and do a tandem skydive! It’s the recommended method when making your first jump. Sky Dive Tulsa offers a tandem skydive course and jump for only $210. The tandem student receives thorough ground school training covering all safety procedures. Then the tandem master guides the student jumper throughout the entire skydive: from exiting the aircraft, and transitioning into freefall, as well as assisting with canopy flight and landing. With one jump under your belt, you can advance to solo IAD jumps (4,000 ft) and accelerated freefalls (11,000ft). More info at TulsaSkyDive.com. Do you find yourself making your own drinks at home and wish they could turn out like the ones at your favorite bar? Are you the one at the party that ends up in the kitchen making drinks? Then enhance your mixology skills by taking a Bartending class. Blue Label Bartending at 33rd and Peoria offers a Spontaneous Bartender course. It’s fashioned for folks like us who want to learn basic bar procedures and popular drink recipes, such as Martini, Margarita, Old Fashioned, Long Island Tea, and more. The six hour class is $250 per person or $400 per couple. Classes are held on Saturdays from 9 am to 4 pm and is limited to six students. Sign up at BlueLabelBartending.com. Want to step up your cake decorating game? Then take the Fondant 101 class at All Things Cake. Learn the basics of decorating with fondant including covering rounds and squares, roses, bows, and so much more. Adult classes are best for those 16+, but younger students are welcome with instructor approval. Each 2-hour class is packed with tips and tricks to help you achieve decorating success at home. All supplies are provided; Any edible items created in class are sent home with students. Cost is $97 and advance registration for the August 24 & 31 class is required by calling 918-994-4490. Details at AllThingsCakeShop.com. According to experts, Belly Dancing can burn up to 300 calories an hour in addition to providing an excellent brain exercise for focus, memory, creativity, and coordination. Feet and ankles are strengthened and legs become sculpted. Abdominal muscles are exercised due to the natural contracting and releasing actions of the stomach which strengthens your body’s core. Upper arms also become toned due to the lovely arm patterns and positions. Sounds good, doesn’t it? Instructor Artemisia teaches beginning and advanced Belly Dance at That’s Dancing Studio. Cost is $35 a month for one class per week or $10 per drop-in class. Check out MidtownTulsaBellyDance.com for more information. African Drumming classes teach us how to become more creative through the beauty of the drum. Held at Living ArtSpace every Wednesday from 7:30-9:00 pm (use the NE door at the side of the building), the class has been an integral part of Living Arts for many years. Instructor Leslie C. Brown will guide you into an infusion of West African, Afro-Cuban, Congolese rhythms, songs, and body percussion along with whatever else someone wants to bring into the class. Cost is $10 per session. Living Arts provides djembe and ashiko drums for those who do not own their own. Visit LivingArts.org for this and many other exciting classes. Learn the basic art and technique of the age old craft of Stained Glass. Tulsa Stained Glass Company has a class coming up on Thursdays, starting Sept 14 through Nov 2, 2017, from 7-9:30 pm. For $175 you will learn pattern-making, glass cutting, panel assembly, soldering and cementing. You’ll practice your skills while building a 10×16 leaded panel. Upon completion, you will have the fundamental skills necessary for making basic stained glass windows and mosaics. 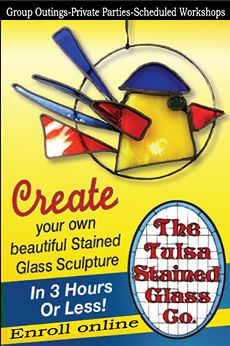 Visit TulsaStainedGlass.com to learn more. Finally, it’s time to get bold with hot, fiery metal. Garden Deva offers Metal Sculpture classes in two different workshops at their location at 317 South Trenton. The intro class (2.5 hrs) offers multiple project options and everyone gets to go home with the art created during class. 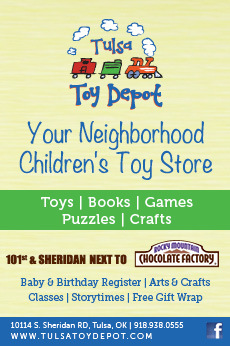 This class is offered on most Saturdays throughout the year, weather permitting. Cost is $80 per person, $150 per couple and all materials are provided. The weekend intensive metal workshop is an intimate, 2-day experience of budding and advanced metal artists with the materials, tools, and information needed to create a unique piece of art to take home. Visit GardenDeva.com for all the details. Hardesty Arts Center (AHHA): 918.584.3333 or AHHATulsa.org. Tulsa Art Center: 918.694.9110 or TulsaArtCenter.com. Tulsa Community College: 918.595.7000 or TulsaCC.edu. Tulsa County Parks Department: 918.596.5990 or Parks.TulsaCounty.org.